An essential guide to navigating the iconic southern franchise's off-menu dishes. The cult-status of Chick-fil-A is undeniable, thanks in no small part to its perfection of the fried chicken fast-food formula. And by no means are we the first ones to notice. David Chang said it inspired his Fuku enterprise; New Yorkers camped out overnight to score free sandwiches; and rival franchises went to the drawing board looking for answers. 2015 proved to be the year of the chicken sandwich, with places like Shake Shack offering riffs on the classic form. But all the chatter only helped cement the legacy of Chick-fil-A as the OG purveyor. 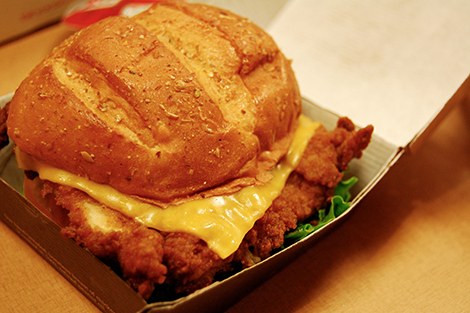 To dig a bit deeper into this fan-favorite franchise, we scoped out CFA’s secret, off-menu items. Where do things like fried-chicken clubs and root beer-floats land on the spectrum of greatness? 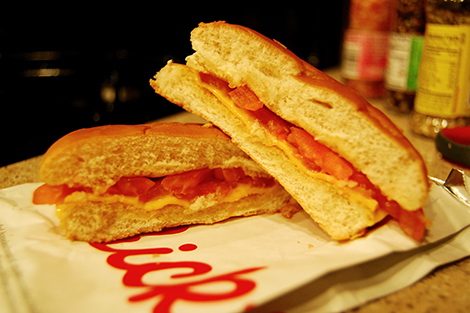 Here are five items off Chick-fil-A’s secret menu, ranked from worst to best. The verdict: There are typically two components a grilled cheese has to have in order to deliver on its promise: evenly distributed melted cheese, and buttery, toasted bread. Without upholding this standard, a grilled cheese simply ceases to be a reliable comfort food. Such is the case for Chick-fil-A. The buns are warm, but not crispy. The American cheese is soft, but not melty. There’s an option to add vegetables, but we found that it only makes the bun soggy. A rare miss for a stalwart franchise. The verdict: In theory, adding bacon to a dish is always a good idea, but in this case, we’d rather do without it. Not only does it lack a crispiness, but it also distracts from the beautiful simplicity of the chicken sandwich in its original form. We’re not purists by any means, but we’re adamant about ditching the pork. The verdict: Securing this item requires a bit of finesse and luck. If you purchase a chocolate chip cookie and a milkshake, and you are really nice to your cashier, there is a small chance you can score the elusive cookie milkshake. Bits and pieces of the crumbled chocolate-chip cookie are always a nice addition to a creamy vanilla base. 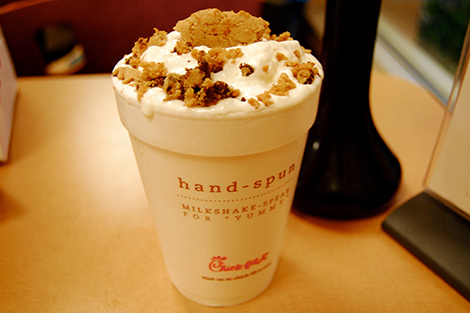 The shake has a tendency to melt quickly, so eat up. The verdict: The root-beer float is a simple yet infallible dessert. 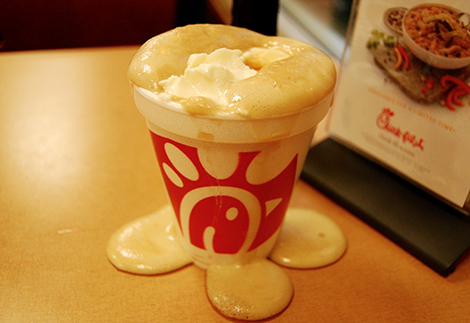 Although not every Chick-fil-A location offers this treat, you can ask your server to place some ice cream into your cup of root beer if you are willing to pay for both the ice cream and soda separately. There is something about pairing an ice-cold float with a fried-chicken sandwich that hits all the right pleasure sensors. The verdict: You will not regret pouring a few packets of buffalo sauce onto the craggy crust of your fried-chicken sandwich. While we love the OG version, the spicy, tangy concoction adds a much needed kick (and reminds us why Chang’s Ssäm Sauce is such a great addition to his own version). 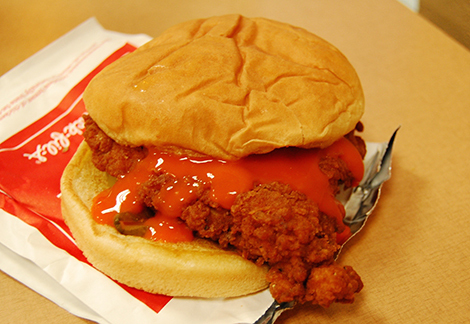 For those unafraid to experiment with heat, start out with the spicy chicken sandwich.